Home » Blog » Hiking Gear Deals for May! Hiking Gear Deals for May! It’s Spring and time to get back on the trails!! And get some good deals on the latest and greatest hiking gear and clothes. REI’s Anniversary Sale coming up May 21-31, 2010! Members will be getting 20% off any full priced item too! Remember you can now get anything over $75 shipped for FREE to your home! REI 2 day only Outlet Sale, May 19-20. Use coupon code OUT2DAY2 for 22% off REI or Pearl Izumi branded REI-Outlet products! Moosejaw.com – 20% off climbing gear through May 19! 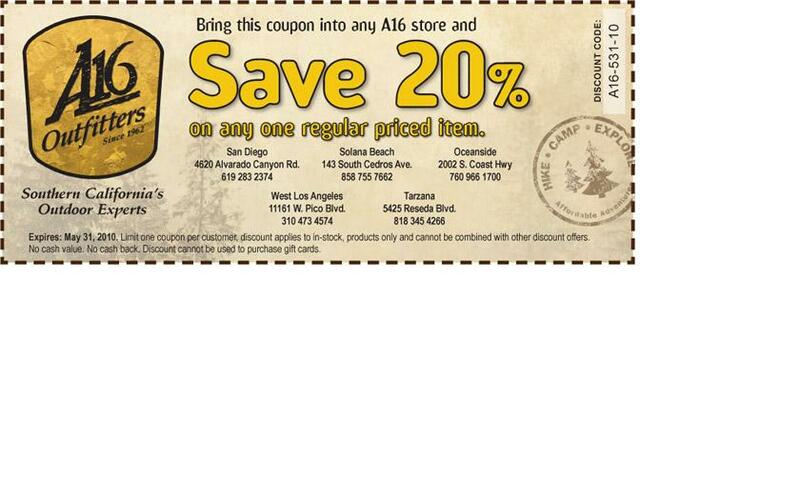 For you Southern California hikers, Adventure 16 just emailed a 20% off coupon! yay! REI Passport to Adventure for Kids. Your kids can get a cool pair of multifunction binoculars or 4 function whistle. Free Flute Music at Amazon May 11, 2010. You can download an entire Native Flutes For Relaxation album for free! Hiking Lady’s May 2010 Contest Giveaway! Enter your email address by May 31 and you’ll have a chance to win a Fox 40 Sharx Whistle! ExOfficio has a contest where you can win a free trip to Jordan; enter by July 31, 2010.